It doesn’t matter what kind of teacher: public, private, or church Sunday School, the purpose of asking questions isn’t to get answers. If only adults could understand that. While I’ve taught college freshmen for over twenty years, I’ve also taught classes in my church. Right now I’m responsible to teach Sunday School to 15-16 year-olds, and because there was some kind of baby boom back in 1999, I have a class of 19 teenagers right now. The leaders in my LDS ward think I need “Help,” and today was a classic example of Question Anxiety. That’s the best way I can put it: when I ask a question, the “Help” jumps in to answer it. Remember, the “Help” is a well-intentioned adult; but this class is for the teenagers, and when I pose a question they sit for a few seconds, thinking. And that’s exactly what I want: I do not want answers; I want thought. The older gentleman helping today obviously wasn’t comfortable with the silence, and tried to fill it each time it manifest itself. But I love the silence! Wonderful things happen during it. First, there’s the first five uncomfortable seconds when teens give each other the sidelong glance to see if anyone has an immediate answer. That’s when the adults get nervous, and want to supply something—anything. Because adults often work with A Plan. No matter what the task or chore or goal, most adults want A Plan, and getting quickly from point B to task H is imperative. Give answers, get moving along. It’s because most of us were raised in the public school system which, even worse now than ever, has A Plan that must completed, no matter the needs of the children, no matter the level of interest—The Plan (quite often linked to Common Core) must be accomplished. My son’s 11-year-old friend encountered this the other day. A substitute teacher set up four stuffed animals: a whale, a tiger, a dolphin, and an octopus. She asked the 5th graders which animal didn’t belong in the group. Before you read further, what would your answer be? Nice meme. Would read easier if the last two lines were, “to ask questions that EVEN YOU can’t answer.” But you get the idea . . .
That wasn’t the “right” answer, and the substitute, for whatever reason, came down a bit hard on him for not giving her answer. Instead of acknowledging that his answer was correct as well, and instead of stepping back and thinking, “Hey, clever. I hadn’t considered that,” she instead snapped at him that the tiger didn’t fit, because the rest of the animals were aquatic animals. Stick to The Plan. Move along. The point isn’t education. The point is completing the task. How tragic. This 11-year-old was thinking. He was right! And that’s what teachers should want when they ask questions: the questions should make students THINK! That’s what happens in my Sunday School class after those first five uncomfortable seconds. In the next five, kids start to muse to themselves, No one else is saying anything . . . maybe I should come up with something? Another five seconds, and then a hand tentatively goes up with a comment I grin at and write on the board. Then another hand. And another. Yes! They’ll get there, without someone stepping in and supplying the answer too quickly for them. But there’s still one more thing I want to have happen when I ask a question. Thinking is first, their responses is second, and then . . .
That was when the Helper, after five seconds, jumped in with several statements of what he, a sixty-year-old man, knew. Frankly, I didn’t care what he knew. I wanted to know what my 15-year-olds knew. Eventually, they began to offer bits and pieces which I put on the board. When I wrote, “Jesus has a body of flesh and bones, and not blood,” that’s when the magic happened. Here’s where the discussion shifted into a little bit of silliness, but I let it. The kids started asking the questions! 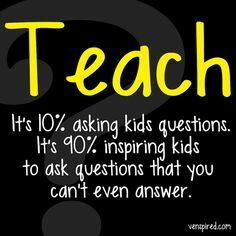 THAT should be the goal of every teacher’s lesson: not getting answers to our questions, but getting questions from our students. That means they’re interested. They’re thinking. They’re engaged! Talk about killing the desire to learn. Kids have it naturally. It’s mostly gone by middle school. Can you see how it died? It’ll take a moment, but always a student will raise a hand and say, “Wait—we can begin a sentence with ‘Because’? What about ‘But’?” And for five minutes we have an interesting discussion, because a student wanted to know that answer, not because the teacher was looking for a programmed response. Think back to any lectures you remember from college or high school. Do you remember any of them? At all? I remember a handful, and every one of them began with a question a student wanted answered, and ended with a teacher involving all of us in the discussion. That is education. That is learning. And it’s rarely happening anymore. Click here to see the curriculum for all of the youth in The Church of Jesus Christ of Latter-day Saints. Go ahead–we don’t bite. At least not that hard. As for my Sunday School class today, Helper began to realize the kids were capable of answering the questions, and to his credit he backed off a bit, especially after I refused to make eye contact with him, but focused solely on the kids. They came through for me again, as they always do, with even a few more interesting questions that filled our 40 minutes quite easily. The LDS Church has purposely changed its curriculum for teenagers 12-18 so that they can run the pace of the lesson, and not the teachers. If only school systems could do that as well: respect the child as a person wanting to learn, instead of part of a group that needs processing. Not only would our children be smarter with that kind of child-focused education, but they’d be happier too, which should always be our foremost goal in education: happiness. This was one of the things Mahrree loved about teaching: the rare moments when a student dares to wonder. The best learning happened when the students asked the questions, not the teachers. It was also at these moments that she panicked, because sometimes the questions were so unexpected that she was caught by surprise. But it was the good kind of panic that lets you remember you’re alive, like being chased by a dog you know you can outrun, but it terrifies you just the same. It feels great when you finally reach home, or see the dog yanked back suddenly by its leash and you gloat at it triumphantly. But first you have to run. Very interesting. I have noticed that when you teach the way the church asks you to, there is no right or wrong answer. Many of my college professors in Biology taught that way. Being pre-supposed to the “right” answer can often blind a person to new discoveries—for example a humble monk named Gregor Mendel who in 1850 discovered the mathematical patterns of genetic inheritance in his vegetable garden. Yet it wasn’t until 1960 that the chemistry caught up so Watson & Crick (using these qualatitives) were able to discover DNA’s double helix.